These boxes are from Hobby Lobby, as are the sombreros on top. If you don’t already know, we are getting married in Mexico, so I wanted to stay on theme with the proposals! 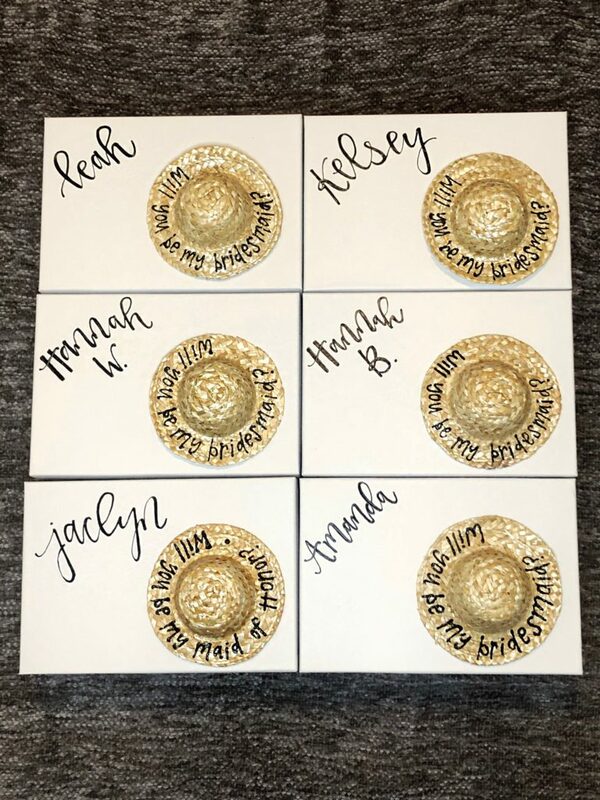 Using Puff Paint, I wrote “Will you be my bridesmaid?” around the brim of the sombrero as well as each girls name in a cute calligraphy font on top of the box. First thing in the box is this adorable romper for the girls to wear day of while getting ready! I knew I wanted to do something unique and different than robes, so after seeing this picture I fell in love with the idea of rompers! These are super lightweight and can totally be worn on other occasions, which I love. They are stretchy and flattering on any body type and I think they will look so adorable in getting ready pics! Next up is a cute little initial jewelry dish. I have one of these myself that I love, so I just thought it would be cute for the girls too! Next is an “I DO CREW” shot glass! 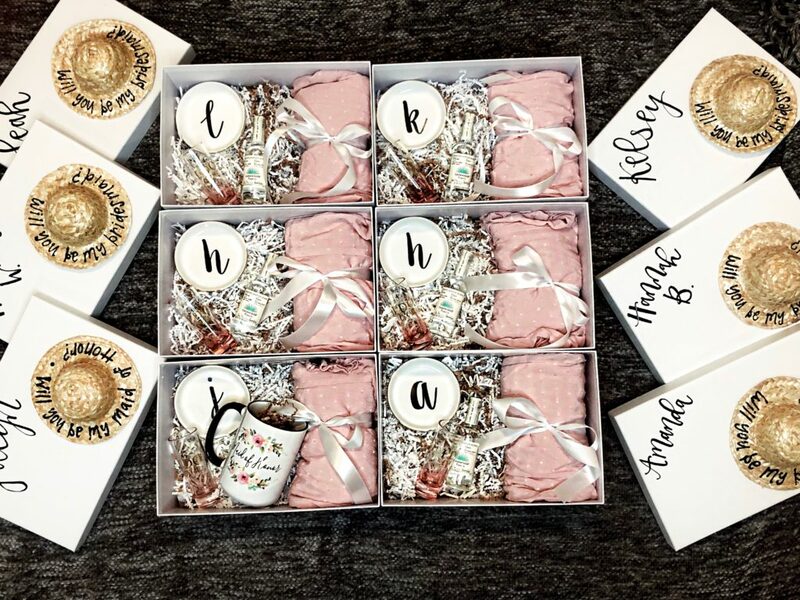 I got these from Francescas and let me tell ya, if you are on the hunt for some adorable bridal-party themed trinkets, you should definitely check out Francescas. 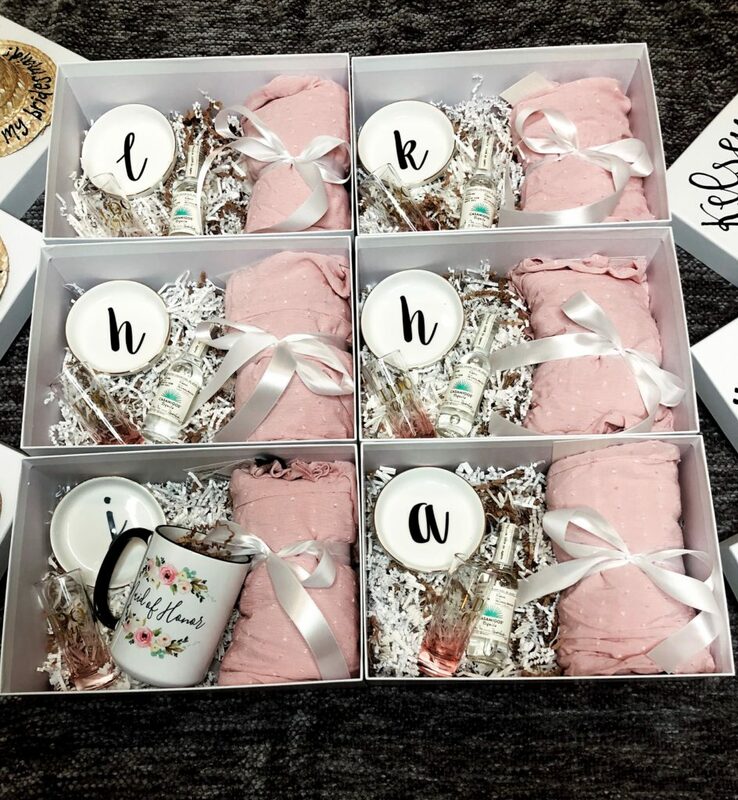 They have some great, unique options at reasonable prices, and I just think these shot glasses are adorable and perfect for the bachelorette party! 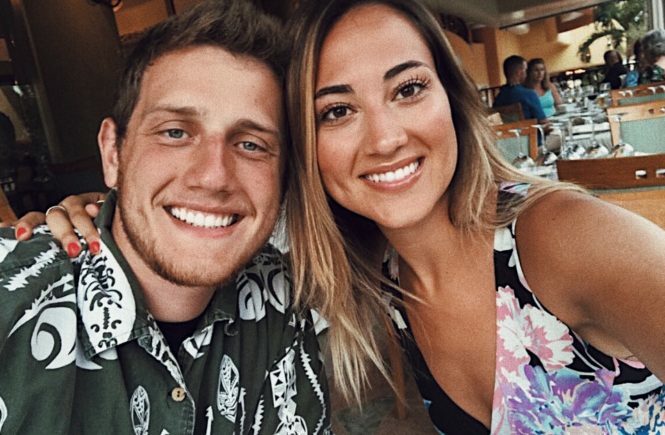 Last but certainly not least, a mini bottle of Casamigos Tequila because… did I mention we are getting married in Mexico?! 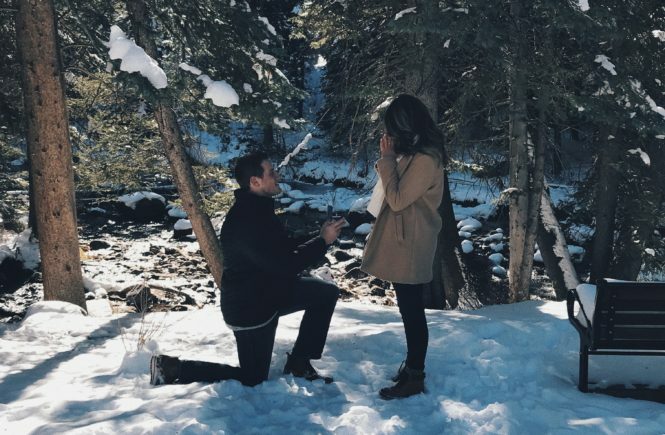 When doing your bridesmaid proposals it’s always nice to do a little something extra for your number one. 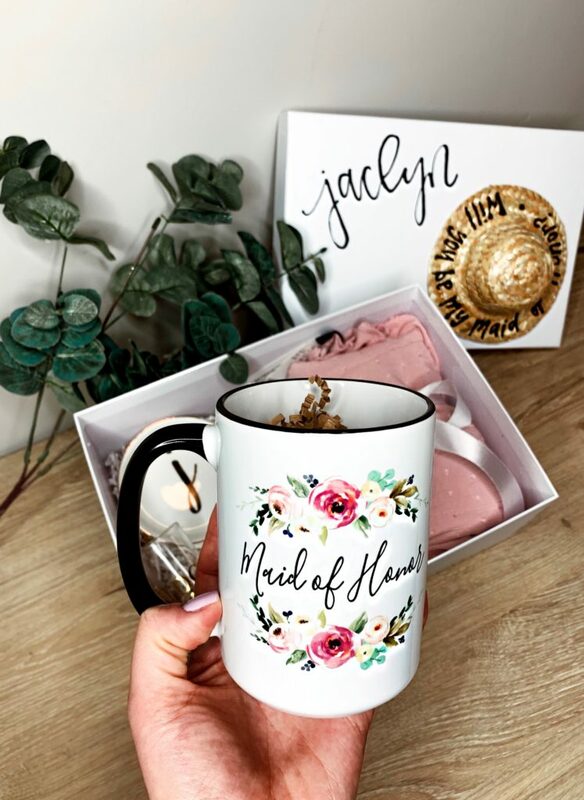 In this case, my sister is my Maid of Honor so I wanted to get her something cute and functional that was also sentimental. I went with this mug from the Etsy shop By Tracey, and holy cow, it could not have turned out any cuter! My sister absolutely loved it and so did I. 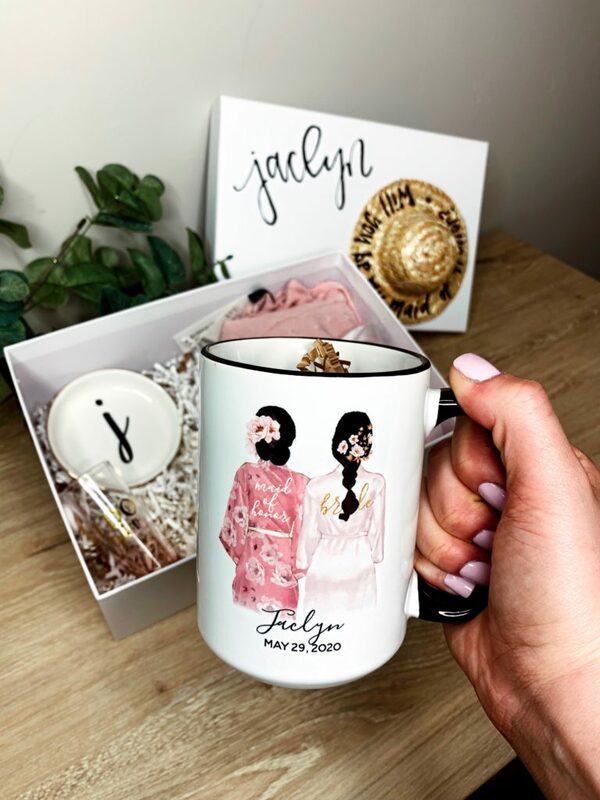 By Tracey has so many other cute, customizable products for all types of occasions and just everyday life, too. I can’t speak enough to the quality of her work and Tracey herself is a total sweetheart. 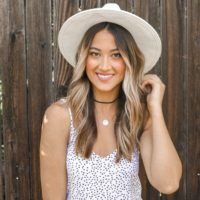 Definitely check out her page! 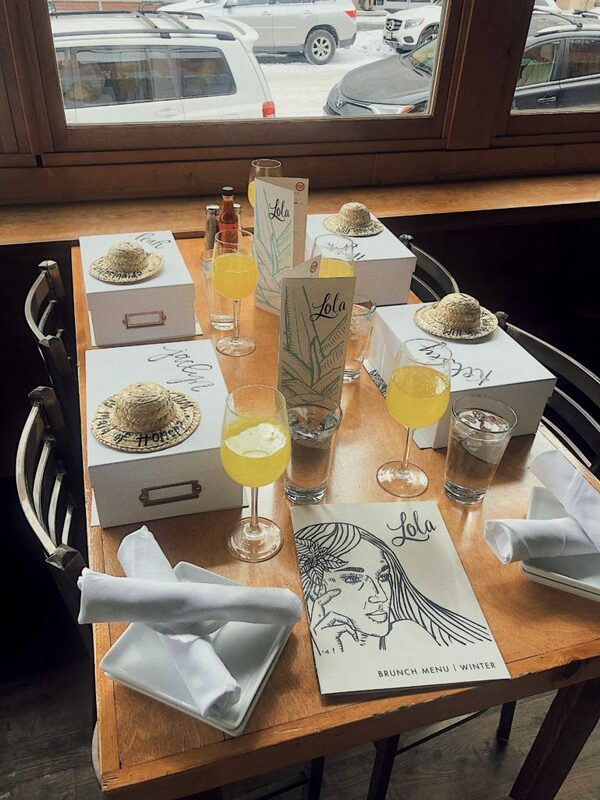 To actually give my bridesmaids their boxes I invited everyone to brunch. Unfortunately Hayden’s sister, Hannah, couldn’t make it and my brother’s girlfriend, Amanda, lives in California and therefore couldn’t make it either, but they were there in spirit!! Staying on theme, we went to a Mexican restaurant here in Denver called Lola Coastal Mexican. 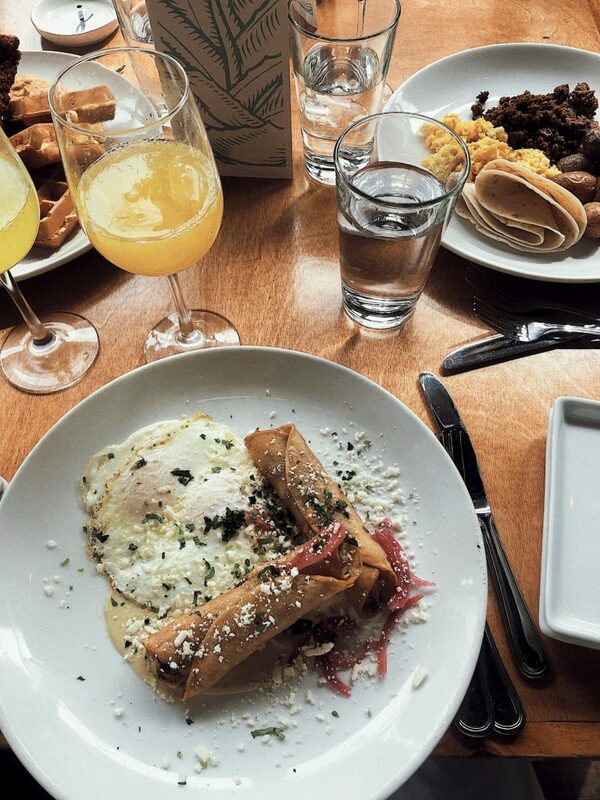 Not only was brunch absolutely delicious, but the staff at Lola were so sweet and helpful in helping me set up! I got to the restaurant early to set out everyone’s boxes and have a mimosa waiting for each girl. One by one the girls piled in and once everyone got there, they opened their boxes all together. 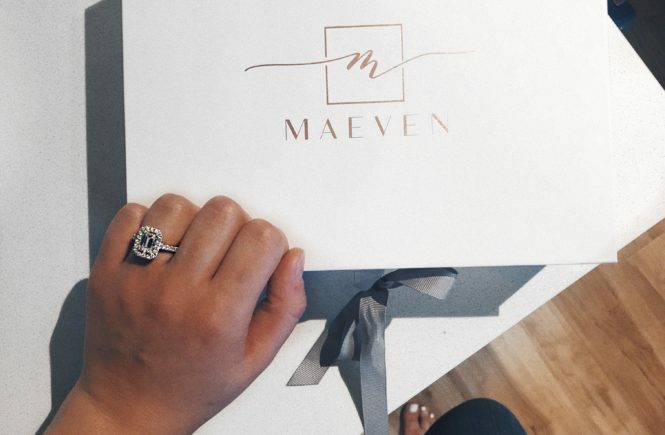 I am so glad I did it this way because after everyone opened their boxes we got to hang out as a bridal party, eat brunch together and talk all things wedding! 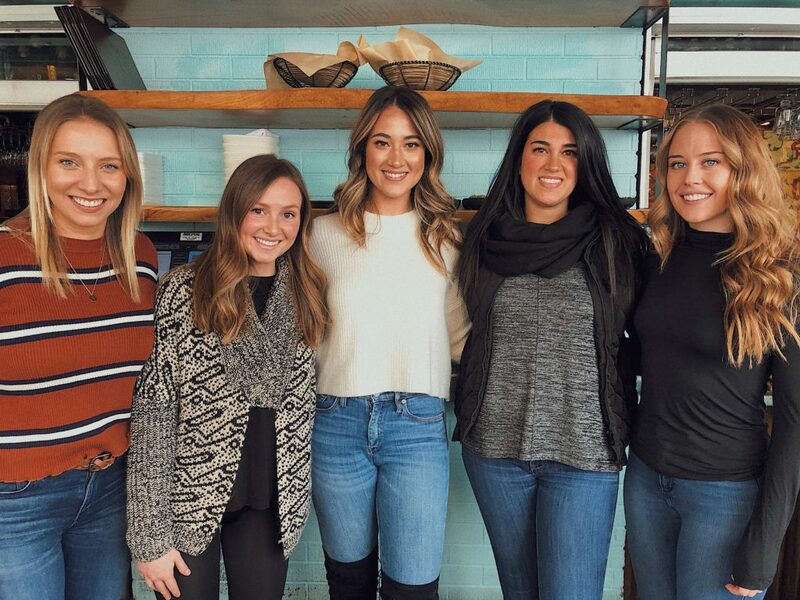 It was a total blast and if you are planning your bridesmaid proposals I would highly suggest getting everyone together for brunch or dinner or a little get together, it really makes it that much more special! Well, there ya have it! I could not be happier about how these proposals turned out or about who is going to be standing next to me on my wedding day! 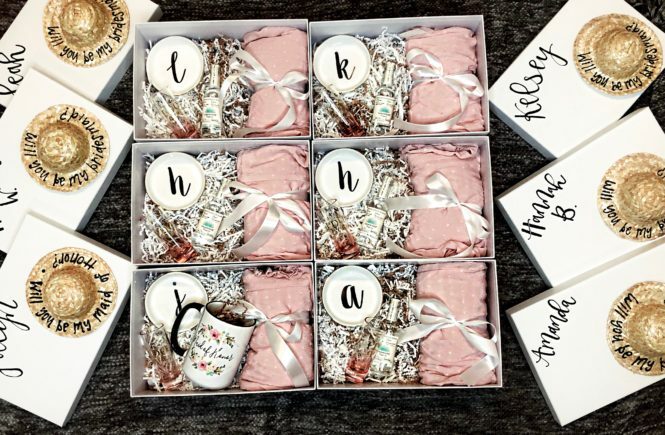 How did you ask your bridesmaids?! I would love to know!